The Sound Healing with the Voice Practitioner Training Core Curriculum comprises five weekend workshops taken over a year and a half. Visit the Course Details tab for pricing information. Please click on the above tabs for details of the Sound Healing with the Voice Practitioner Training Course. Details of Course Tutors and Venues can be found on the Practitioner Training Dates page. As well as completing the core curriculum students will need to complete one or two additional Sound Healing Workshops. Details of these workshops can be found on the Sound Healing Workshops page. Watch a YouTube video demonstrating Sound Healing or another video about the Sound Healing Practitioner Course. There are more videos on the College YouTube Channel. Dr Shelley Snow of Concordia University has conducted Scientific Research into the sound healing method taught on this course. The Core Curriculum comprises five weekend workshops taken over a year and a half. The five parts of the course should be taken in order. Students will also need to complete two additional Sound Healing Workshops during the time that they are training. Attending the College of Sound Healing Conference counts as two workshops. It is helpful if participants have had some experience of healing or voice work before attending the course. Students should complete the five weekends of the Sound Healing with the Voice Practitioner Training with one tutor. There will be a practical evaluation in which the participants will have to give a supervised sound healing treatment to another student. Thirty-six practice treatments will need to be carried out and written up to complete the course. It is possible to do up to three treatments on one person. Two pieces of written work of approximately 600 words each will need to be completed by students after each part of the course. Students will also need to complete a 3,000 word essay. The 3,000 word essay will be marked by an external assessor. There will be a charge of £25.00 for this. As well as completing the core curriculum students will need to complete one or two additional Sound Healing Workshops. These workshops can be taken before or during attending the core curriculum. Students need to do their additional Sound Healing Workshops with College Tutors or attend the College Conference. Any day or weekend workshop shown on the College web site counts as an additional Sound Healing Workshop. Exceptions are made for students coming to do the Practitioner Training from Overseas. They can attend equivalent workshops in their own country. The College of Sound Healing is a Member of the Complementary Medical Association (CMA) and the Therapeutic Sound Association (TSA). All the College's Practitioner Training Courses are evaluated and approved by the CMA and the TSA. At Part Two of the Practitioner Training Course you will need to become a Student Member of the College. Student Membership is £30.00 and has a duration of two years, giving you plenty of time to complete your Practitioner Training. To become a Student Member please go to the Membership page. Once you have completed the Practitioner Training you can become a Member of the College of Sound Healing (MCSH) and the Therapeutic Sound Association (TSA). The cost of College Membership is £45.00 per annum. Students are expected to have a basic knowledge of anatomy and physiology and hold a current first aid certificate. Once they have qualified, College Members are expected to choose activities to fulfil a minimum of 20 hours Continuing Professional Development per year. Simon Heather has written two books to accompany the sound healing training (see Books and CDs page for more information). The Sound Healing Practitioner Training Course consists of five weekend workshops over an 18 month period. The cost for each weekend workshop is £200 in the UK / £250 in the London Area / €250 in Ireland. Payment for each workshop should be made in full at least two weeks before the date of the workshop. If payment is made in full in advance for the whole course it is non refundable but can be transferred to a future course with that Tutor. The course cost includes the Course Book ‘Sound Healing Practice’. The cost of the Additional Sound Healing Workshops will vary depending on which workshops are taken. Any payments made for the course are non refundable. Students will need to become Student Members of the College and have insurance cover while they are training. Student Membership costs £30.00 for two years. This will allow you sufficient time to complete the course. Insurance for Student Members is £35.50 per annum. Students will need to purchase a set of Biosonic Body Tuner C&G Tuning Forks (£53.00 plus £3.90 postage). Students will also need to purchase two CDs - ‘College Course CD’ and ‘Seven Healing Drones CD’ (£10.00 each) These are available from the College website or from your Course Tutor. The CDs can also be downloaded for £6 each from the College website. Part One of the Sound Healing Practitioner Training Course can be booked using the BOOK NOW facility on the Training Dates page. To reserve your place you will need to pay in full at least two weeks prior to each course weekend. You can pay for Part One with PayPal using the link above. Alternately you can pay the Tutor directly by BACs or cheque. The College has a cancellation policy that will be sent to you when you book your place. Please make sure that you fill in the booking form and send it to your course Tutor. Please contact your course Tutor to make sure that there is space on the course before you book your place. The number of places on each course is limited so that students can get the maximum support from their course Tutor. 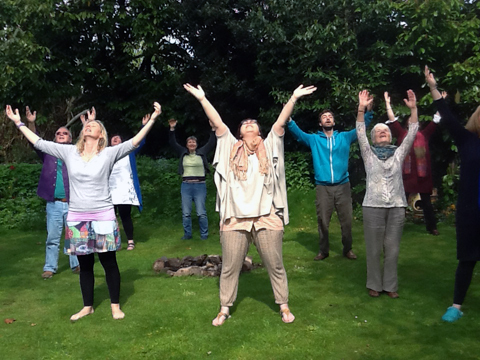 Most workshops will begin with some gentle Qi Gong or Yoga exercises. Please wear comfortable clothes and bring a blanket and a pillow with you. The College has a Block Insurance Scheme. The premiums are £35.50 for Student Members and £53.25 for Graduates in the UK. Students need to have insurance cover while they are undergoing the Practitioner Training. Practitioners who already have insurance cover may be able to add sound healing to their existing policy at no extra charge. 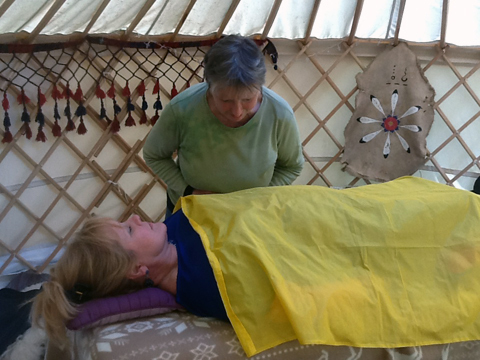 Students who wish to do the Sound Healing with the Voice Practitioner Training Course for themselves and not do not wish to do the homework and case studies do not need to have insurance cover and a first aid certificate. At Part One, the Course Tutor will assess if students are ready to progress to Part Two of the course. Jo - "June and Rob are kind and patient teachers who deliver the course content with the added wisdom of their own experiences as healers. Simon and his fellow Tutors have obviously worked very hard to devise the course and make sure that it is based on proven results." Alan: "The course enabled me to develop a new sense of purpose and confidence in establishing myself as a sound healer which has expanded in a remarkable way." Alexandra: "A wonderful experience covering all the necessary tools a person needs to become a sound healing practitioner. The emphasis is on the practical side which for me was so important as to be a practitioner one is needs to learn how to 'practise'. It was a year of enlightenment!" Anne: "I just want to say that doing the practitioner's course is literally changing my life and opening my heart in ways I could not imagine." Helena: "The course has been hugely beneficial, connecting with my voice, a connection I lost a while back but now I’m re-establishing my connection. Plus it’s the connection to the authentic voice. What a journey I feel very blessed. The link I’ve been missing that the journey is now under way!" Jean: "Receiving healing has been profound.Finding others to share the journey and to speak this language – Great!" Joan: "It has changed the way I look at life and people. In a nutshell it has given me great freedom. The light just woke up in my mind that we are all one so why be afraid or fear anything or anyone." Joan: "I looked forward to all the weekends so much. The course was so well organised, amazing energy flowing. The only word is AMAZING." 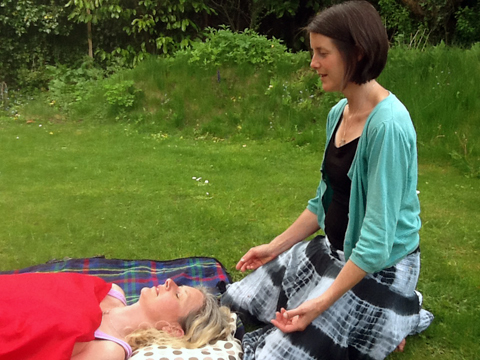 Katie: "This course has opened me up to love, compassion and understanding on a deeper level. It is helping me to integrate sound into each and every day, thus enriching my life." "The Tutors were extremely professional throughout the year and were extremely informative. The treatments were powerful and heartfelt. I was blown away as it heightened my gifts." Kirsty - "The course was one of the best learning experiences I have ever undertaken. The course was the perfect balance of factual knowledge, demonstration of practical methods for providing sound healing and time to experience sound healing for ourselves. The course encouraged and allowed us to be in tune with ourselves and develop our intuition for healing. This was all done in a safe and respectful environment. I feel that you need to experience the course to understand how profoundly it affects you on every level." Kzee: "Mikes sound healing course is intensely transformative, profound and illuminating. His energy, love and commitment for sound healing radiates so brightly through him - I am so deeply grateful for this experience." Linda: "It's one of the best courses I've ever been on." Lisette: "Fascinating and challenging; intensive and chilled. I have learnt such a lot from these weekend workshops, such hope in ways of healing, such a powerful healing that I will incorporate into my own methods and music teaching." Nagy: "In every aspect. Connecting to myself, gaining confidence in my strength in a case studies, practice and support. Bringing me friends, feeling loved and joyous. Not to forget about a great tools received. Truly life changing." Samantha: "The five weekends that I have spent on this course have been an absolute joy." Sue: "On a personal level I have a whole new bunch of wonderful friends. I have learnt a really powerful healing method, confidence, focus, new direction, self development. I have also learnt a lot about myself, including self-acceptance. Undoubtedly the best course I have ever done." Vikki: "The course has been the most amazing experience and took me on a personal healing journey for which I will be forever grateful. I am so much more at peace with myself now." 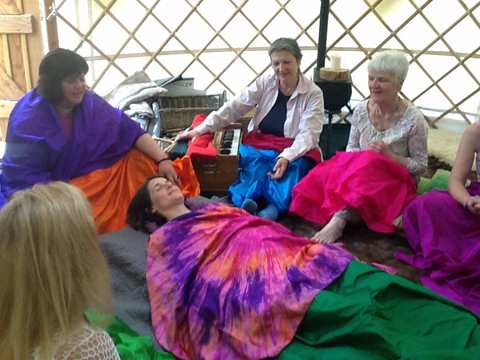 Yvonne: "The Sound Healing Practitioner Course was a very powerful experience. This course was exactly what I needed. The combination of the sound and the spiritual support around the course meant that every weekend was a joy. I had done a number of modules with BAST, but although the left brained approach gave me some useful tools, this was not the right place for me to qualify. The College gave me the 'complete package' - thank you!"